One of the many reasons to use Google Docs on your Chromebook is the symbiosis between Docs and Google Drive. Drive is Google’s cloud-based storage solution that allows you to safely store your files and access them from any device with an Internet connection. Every document you create with Docs is saved to your Drive folder so that you can access it at home, on the road, at work, or anywhere else you might need it. When you create a new document with Docs, Docs automatically saves the document to your Drive. As you edit your document, Docs continuously saves each change to Drive so that you have almost no risk of losing your information. There is actually no manual Save feature in Docs for this very reason: You will forget to save your document, but Docs won’t. Rest assured, your work is safe with Google. When you open a new document with Docs, the default name for the document will be Untitled Document. However, you won’t want to leave your document named this way. Drive doesn’t have a problem with storing multiple files with the same name, but it may easily confuse you. The easiest way to do this is simply to launch Docs from the App Launcher. 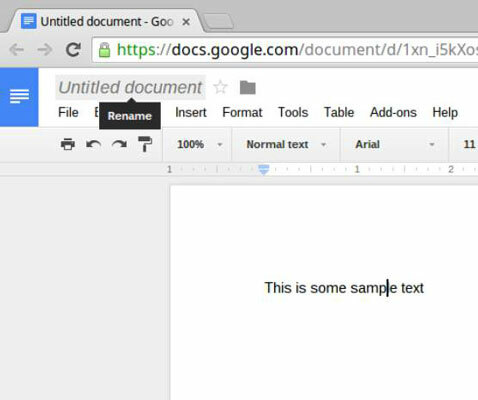 A Chrome web browser opens and loads Docs — and a new document — automatically. Once Docs is open, the name of your new document, Untitled Document, appears in the top-left corner, as shown. Click the name Untitled Document. The Rename Document pop-up window appears in the middle of your screen. The name of the document appears highlighted in a form field. Type the new name for your document in the Name field and press OK. The pop-up window disappears, and the name Untitled Document in the top-left corner has been replaced with the new name you entered. Your document now appears in Google Drive with the new name. As you continue to make edits to the document, those changes will be updated and saved in real-time. 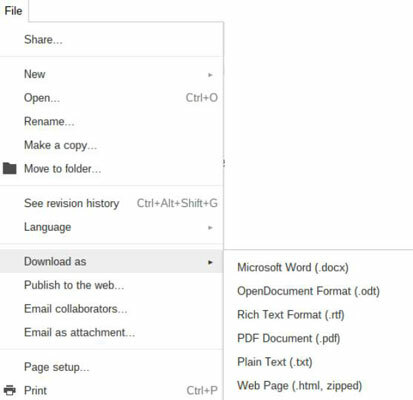 Exporting documents to different file types may change the formatting within your document. Plain Text, for instance, is as the name says: plain text. No formatting is carried through. Before sending your exported documents, review them to ensure everything is as it should be! In the File menu, hover your cursor over Download As. A submenu appears, revealing the document types available for export. Your Docs file is exported in the desired file type and is automatically downloaded to your Chromebook. To view the downloaded file on your computer, click the arrow next to the filename in the bottom of your browser window. A menu revealing several options appears. Files launches, showing you the file in your folder.